"Everything has a meaning, if only we could read it." 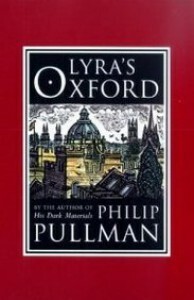 I knew nothing of this book other than the obvious connection to Pullman's His Dark Materials universe. I was surprised how eager I was to reconnect with Lyra and Pantalaimon! I've missed them so since I completed the trilogy. [The starlings] didn't seem like individual birds, or even individual dots of black against the blue; it was the flock itself that was the individual. It was like a single piece of cloth, cut in a very complicated way that let it swing through itself and double over and stretch and fold in three dimensions without ever tangling, turning itself inside out and elegantly waving and crossing through and falling and rising and falling again. PAN: "It feels as if the whole city's looking after us. So what we feel is part of the meaning, isn't it?" LYRA: "Yes! It is. It must be. Not the whole of it, and there's a lot more we don't even know is there, probably." The city, [Lyra's and Pan's] city--belonging was one of the meanings of that, and protection, and home. For Pullman, we're all in the business of meaning-making. And there's nothing religious about this story-based vocation of ours. Notably, Pullman doesn't take the machete to Christian belief here, but he certainly doesn't give it special treatment as a primary source of meaning, either. Meaning-making for Pullman is a subjective exercise, and everyone participates whether they know it or not. I disagree with Pullman on the religious front. But I do love having him as a dialogue partner. He writes and makes meaning beautifully.